Visit the Applications and Articles for the latest research & data. 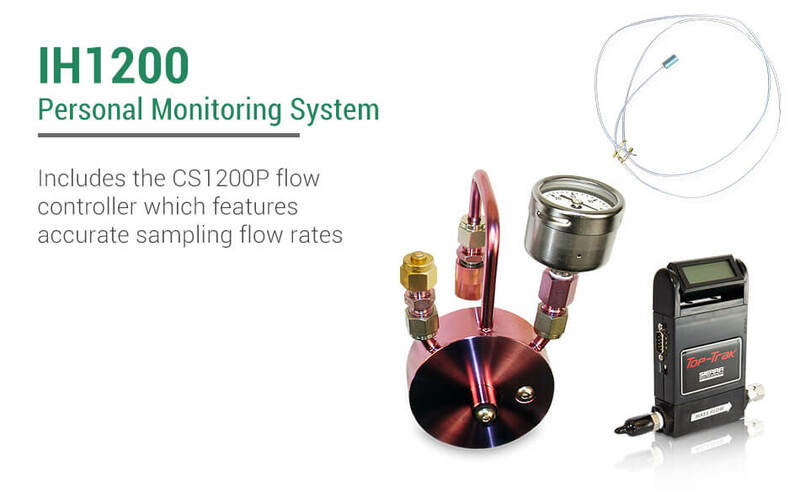 Entech’s turn-key solution to soil gas sampling – designed with you in mind. 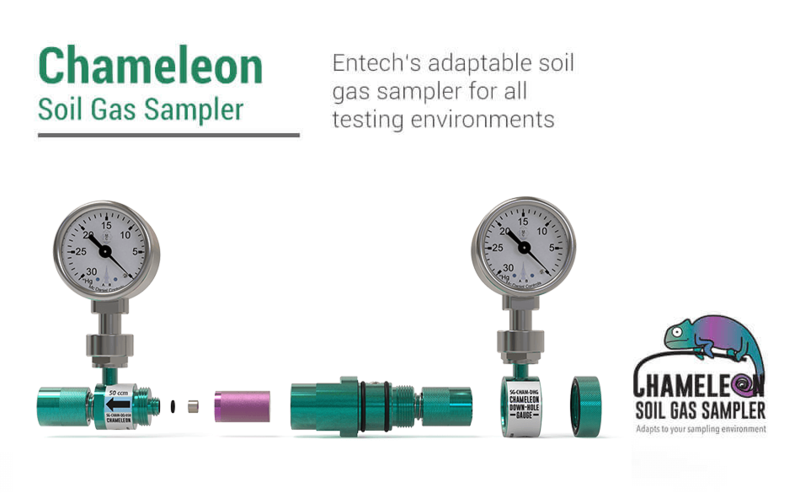 Our Chameleon Soil Gas Sampler provides an all-in-one solution that will challenge the standards of soil gas studies worldwide. Nickel ferrules seal and are easily replaceable just like Graphite-Vespel™ ferrules, yet just like stainless steel ferrules, they are also non-contaminating and cannot be removed by hand. 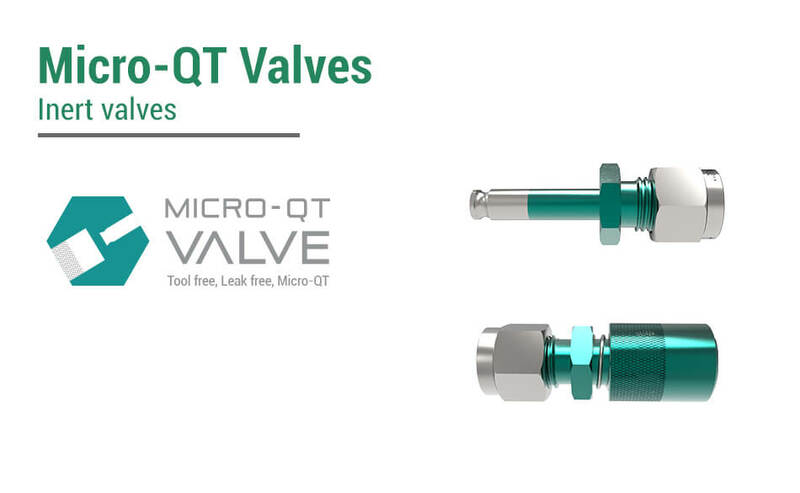 The Micro-QT is a next generation gas valve offering uncompromising leak-tight performance in an ergonomic design. The Micro-QT is also versatile, providing numerous connection options to cover a wide range of applications. Once the valve is connected to tubing using compression fittings, mating male and female valve ends is literally just a quick “snap”. 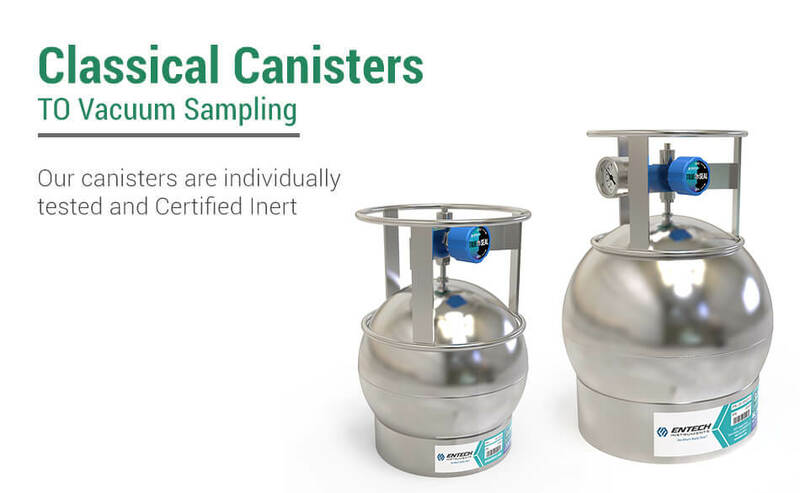 MiniCans™ are the next generation of air sampling canisters from Entech. Designed for tool-free operation and advanced robotic analyzers, Silonite™ treated MiniCans™ allow the recovery of a wider range of compounds than any other sampling canister – including semi-volatiles up through the full diesel range and C25 hydrocarbons. Silonite™ Classical Canisters for (VOC) Volatiles Sampling. Entech’s Silonite™ (Silonite™ VS Summa) canisters feature a large volume capacity for detection of volatile chemicals down to the low part per trillion range. An inert and durable internal Silonite™ coating provides a high-quality, long-term sample storage solution. 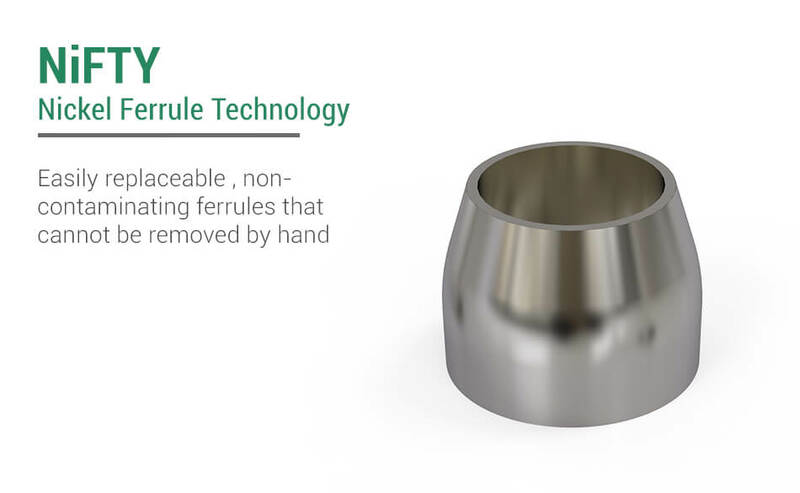 Losses in the valve are avoided by using our Toxic Organics Valve™ (TOV-2™) which includes Entech’s new “sure-seal” technology and low carryover, replaceable nickel ferrules. The 1900 Multi-Channel Canister Sampler is Entech’s next generation solution for collecting air samples in Silonite™ coated canisters for detailed analysis in the laboratory by GC/MS or GC/FID/MS. 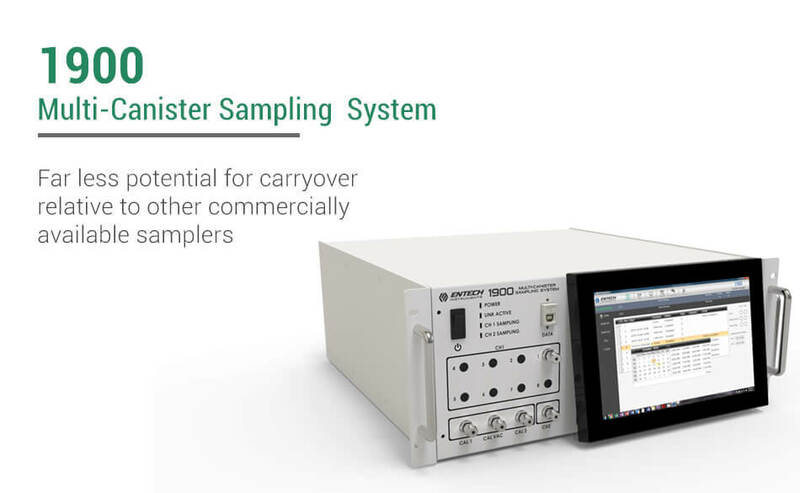 A dramatically improved flow path now creates far less potential for carryover relative to other commercially available samplers. The TM1200 is Entech’s next generation canister sampling timer that automatically starts and stops the sampling process at specific times. Now you can easily start a 24 hour sample at midnight and stop it at midnight the following night without having to be present. 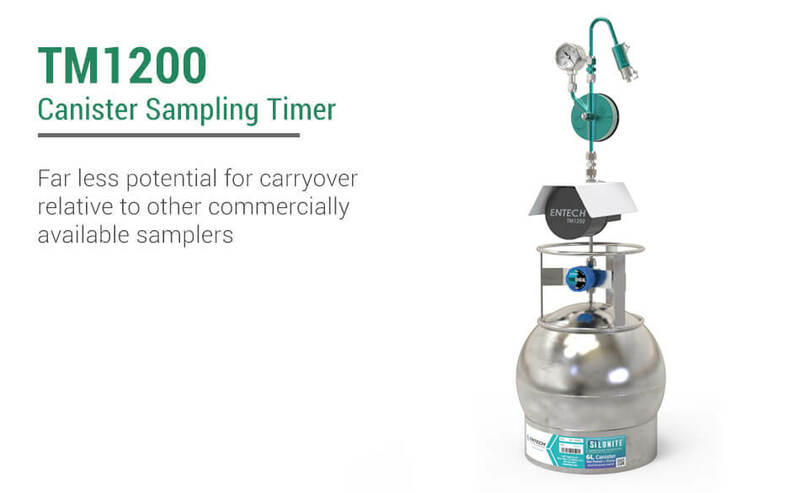 Typically operated with our CS1200Ex canister sampler to time integrate the sampling event for a 24 hour sample, the TM1200 creates an optimized solution by exposing the collected sample to a very short, inert flow path for maximum compound recovery and minimal carryover. 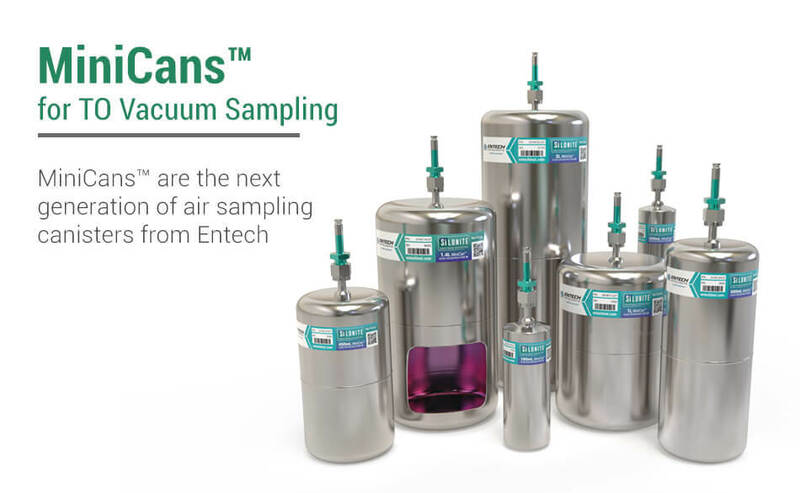 Introducing Entech’s breakthrough technology for whole air sample collection – Helium Diffusion Sampling (HDS™). 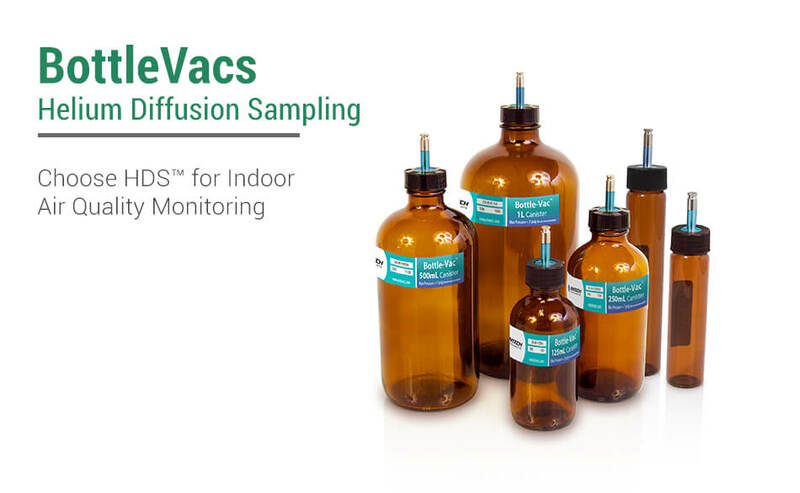 We now offer HDS™ active sampling solutions for indoor air monitoring that simplify the collection of airborne chemicals for GC and GC/MS analysis. 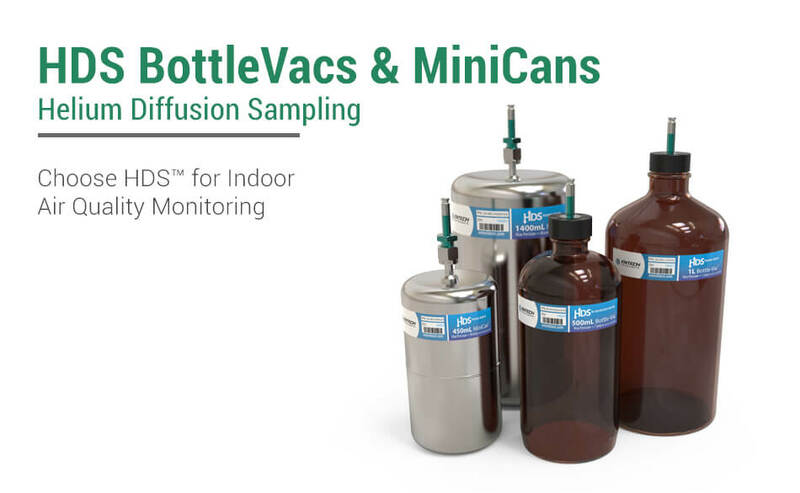 Rather than performing a traditional vacuum sampling event, MiniCans and Bottle-Vacs™ are initially filled with helium, or helium with a recovery surrogate, and active sampling occurs in response to the controlled exchange of helium with air through a diffusion region. 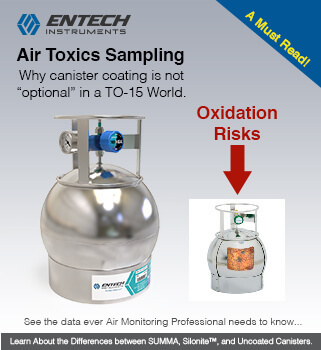 Performing unfiltered sampling into your Silonite™ canister can lead to particulate contamination. This will eventually reduce volatile compound recovery while making it more difficult to achieve EPA required blank levels. 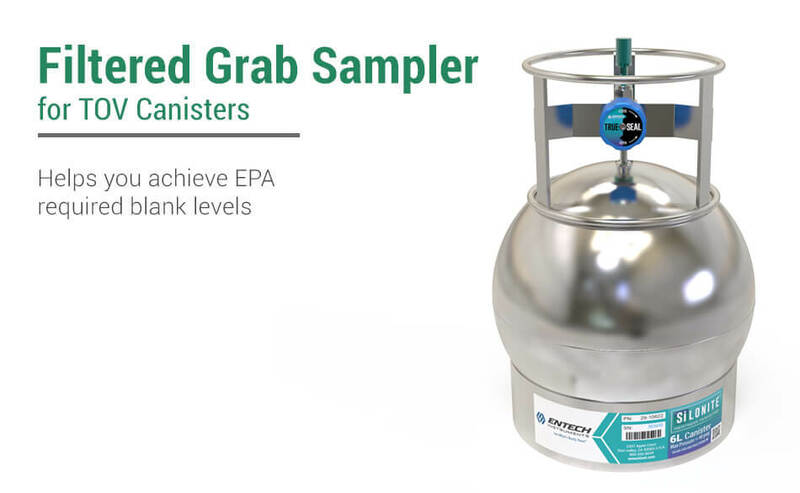 Entech’s Grab Samplers are a great solution to keep your canisters clean. 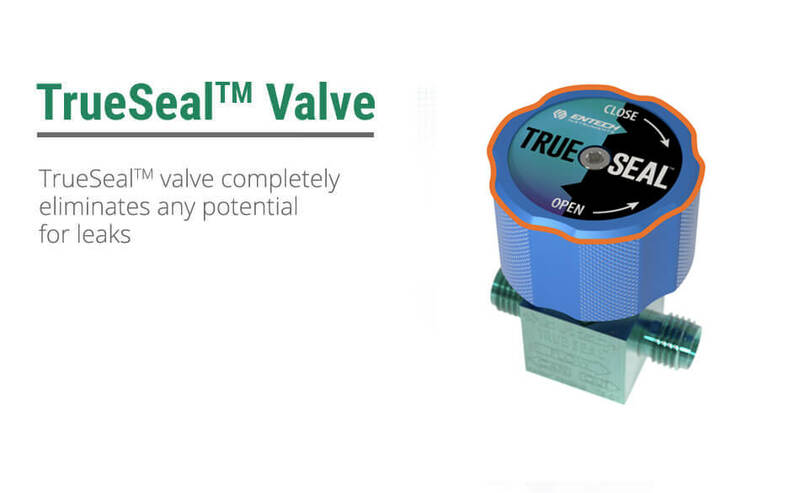 Entech wanted to go a step further with the TrueSeal valve and completely eliminate any potential for leaks. To achieve this, a small O-Ring was added as a secondary seal. 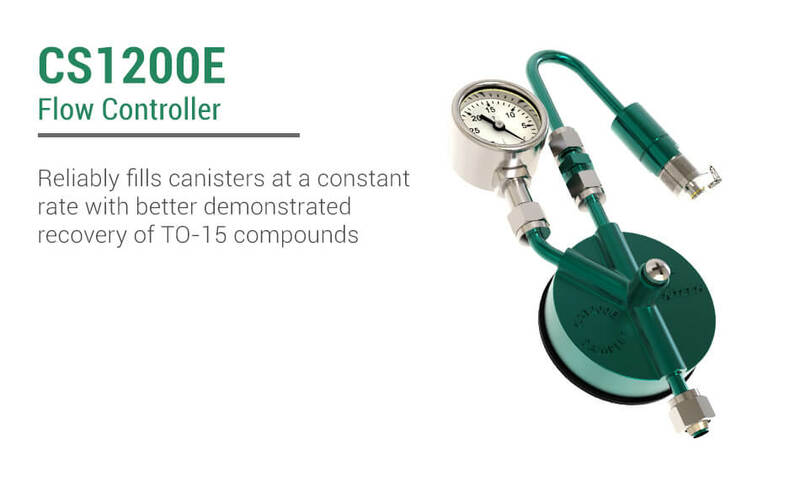 This O-Ring has 15x less viton than the popular Bottle-Vac™, 30x less viton than both of the major flow controllers in use today, and is positioned outside of the influence of the canisters vacuum. 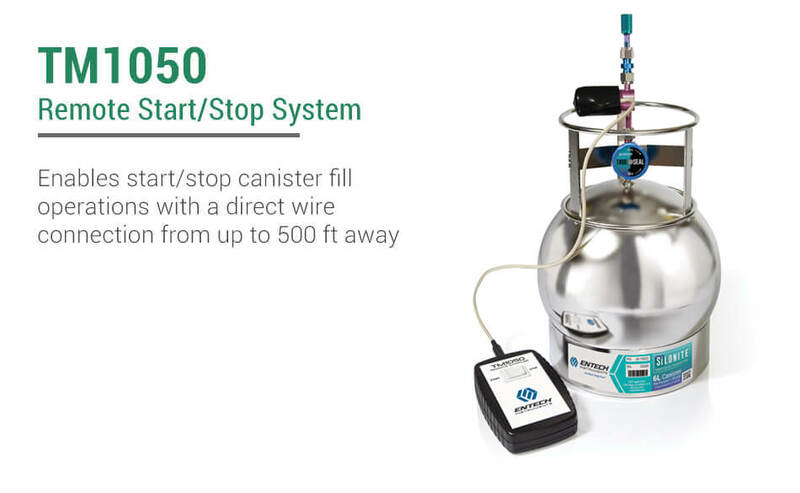 TM1050 enables start/stop canister fill operations with a direct wire connection from up to 500 feet away.TM1050 system includes a Remote Control Unit, Start/Stop Valve Assembly, and a 20′ remote cable. Order 39-TM1050S for Silonite™ coated Start/Stop Valve Assembly version. 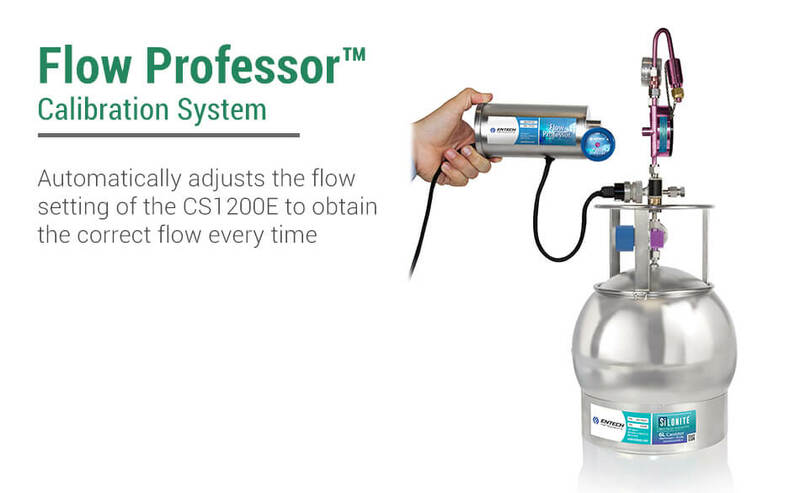 The FlowProfessor™ automatically adjusts the flow setting of the CS1200E to obtain the correct flow every time. The sophisticated software even adjusts for estimated field temperatures and sampling site elevation to optimize sampling rates under any environmental condition. Trying to accomplish those calculations manually can be difficult at best. Bottle-Vacs for (VOC) Volatiles Sampling. In the laboratory, analysis by loop injection requires either pressurizing to 3–7psig, or heating to 60–70°C to increase the pressure to purge a loop. Bottle-Vac™ samplers can also be analyzed using the 7200 or 7100A Preconcentrator to withdraw a larger volume for low PPB analysis. Automated analysis can be performed using the 7650, 7410D, or 7032A Autosamplers. Entech has engineered a new “twist” in whole air monitoring that eliminates many of the potential sources of error found in other sampling methods. 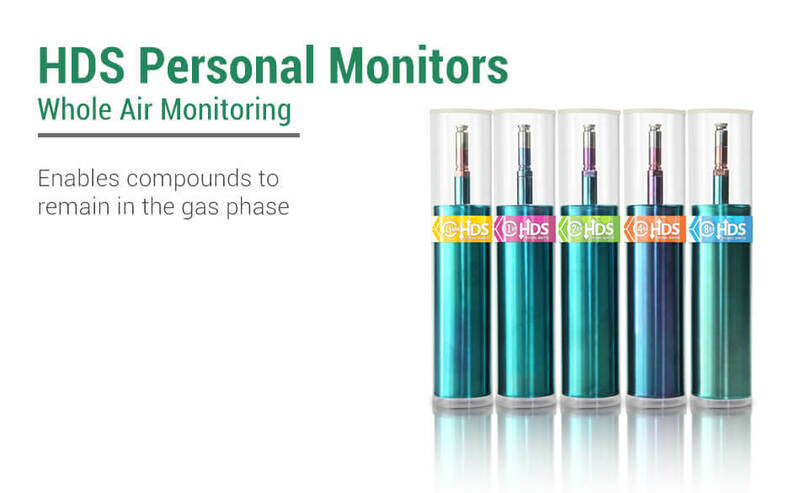 Unlike other monitoring approaches such as tubes and badges, the new HDS™ Monitor enables compounds to remain in the gas phase where chemicals are much less likely to interact. The IH1200 Personal Monitors utilize classical vacuum sampling into MiniCans™ and Bottle-Vacs™ to perform STEL or TWA monitoring for up to 12 hours. Like HDS Personal Monitors, sampling using the IH1200 eliminates the concentration and matrix effects associated with adsorbent-based sampling techniques. 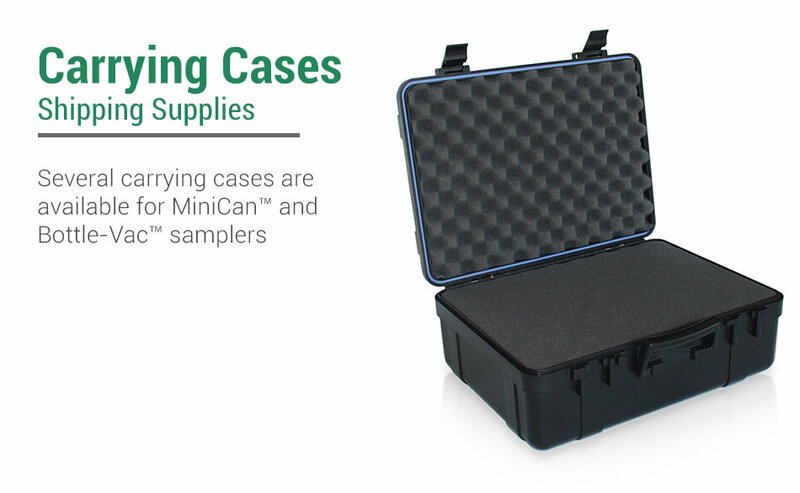 Several carrying cases are available for MiniCan™ and Bottle-Vac™ samplers. Options are based on the number and size of canisters needing to be shipped. 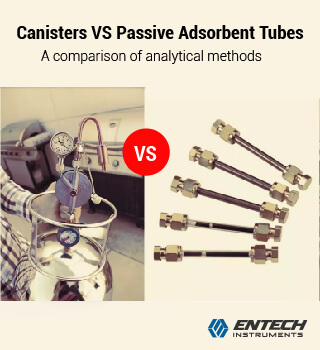 Refer to the chart below for canister and valve compatibility. Custom kits can be made using PN 29-20810 which has pre-cut foam inserts to accommodate canisters, samplers, and test gauges.